High quality HALO V clone. New in box. This is Not a Microtech product. That said, this is a very well built knife. All tolerances are to thousandths .. Very good used condition, blade tip seat below the liners and blade fire with authority when the button is pressed. safety works as intended .. Very good used condition, blades tips seat below the liners and both blades fire with authority when theb uttons are pressed. safeties work as intende.. Here is something heavy duty ariel style switchblade yellow elk stag .140 thou thick 440-C RC 57 hardness razor sharp fighter style blade opens by pus..
NEW OLD STOCK ITALIAN STILETTO 9" SWING GUARD LOCK BACK SWITCHBLADE KNIFE MADE IN 1980S WITH GENUINE SNAKEWOOD HANDLES. 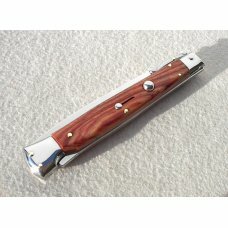 IT HAS A MIRROR POLISHED STAIN..
NEW OLD STOCK ITALIAN STILETTO 9" SWING GUARD LOCK BACK SWITCHBLADE KNIFE MADE IN 1980's WITH GENUINE BRAZILIAN NORN HANDLES. IT HAS A MIRROR POLISHED..
4 1/4" closed fires fast, locks open solid with some wiggle lock botton works great quite full blade with patina shipped fast and well prrotected in b..
9 3/4" OPENED ABOUT 5 3/8" CLOSED 4 3/8" BLADE rare knife works great shipped fast and well protected in bubble wrap in a box ..
9" opened 5" closed 4 1/8" blade works great This knife is unusual in that you have to perform 2 operations to close it. You have to depress the lock ..
NEW OLD STOCK 2013 AGA CAMPOLIN SICILIAN 12" SWITCHBLADE MADE IN MANIAGO ITALY. THE BLADE IS POLISHED STAINLESS STEEL WITH 4 MILLIMETER BLADE THICKNES..
A Classic Italian Automatic Pocket Knife with Original Sheath. This is the Automatic Version of the Famous ANGEL Folding Knife Produced by Falcon Kni..
NOS Italian Collini flylock automatic knife. I first bought one of these back in the 1990s for $85.00. I have come across a few of these recently. Min..
New OLD STOCK 2015 13" A.G.A. Campolin Italy Solid Nickel Silver Shield Button ( Batwing ) African Ebony Wood Bayonet Swinguard Stiletto Switchblade K..
X3M1 SWITCHBLADE WITH PUSH BUTTON, AND SLIDING LOCK. STAINLESS STEEL BLADE, 4 5/8" CLOSED, 8 " OPEN WITH BELT CLIP ON BACK NEW IN BOX..
X3M1 SWITCHBLADE WITH PUSH BUTTON, AND SLIDING LOCK. 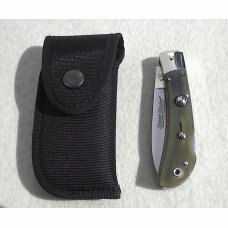 STAINLESS STEEL BLADE, 4 5/8" CLOSED, 8 " OPEN WITH BELT CLIP ON BACK.. This vintage IMPERIAL auto knife has an iron lining. The handles of this old folding knife are made of a plastic material over tin. The handles are .. This vintage SCHRADE WALDEN Black auto knife has nickel bolsters and a brass liner. The handles of this old folding knife are made of a black pl..
SWITCHBLADE STAINLESS STEEL WITH BELT CLIP AND SLIDING LOCK EXECUTES EXCELLENTLY, WELL MADE, BRAND UNKNOWN 3 3/4" CLOSED..
DALE EARNHARDT JR #8 RACE CAR SWITCHBLADE KNIFE K601 WITH BELT CLIP AND SLIDING LOCK 4" CLOSED, 6 7/8" OPEN STAMPED USA MADE IN CHINA STAINLESS STEEL .. 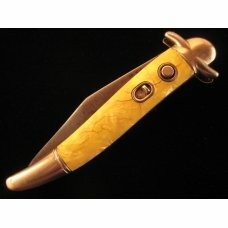 This vintage SCHRADE CUT CO. bone auto knife has iron bolsters and liner. The bolsters have some minor pitting. The handles of this old folding kn..
Italy Stainless Stars Bolster Lock 8.75" Italian Stiletto Swithchblade Knife c.1970's or 1980's - Plastic Handles - Rear Top Rivet Crack - Strong Fire..
You are looking at a Vintage Scale-Release Automatic Switchblade Pocket Knife, circa Late-1990s. 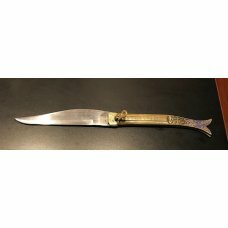 FEATURES INCLUDE: Partially-Serrated 440 Stainless-St..
NEW OLD STOCK 11" ITALIAN BELTRAME ( PICKLOCK ) STILETTO - 3.5MM THICK BLADE AND BACK SPRING - 11 INCHES IN OPEN POSITION - GENUINE STAG HANDLES - ( .. 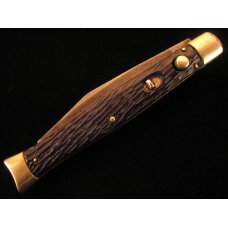 This ITALIAN auto knife has a brass lining. 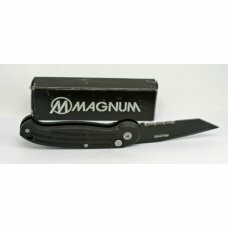 The handles of this folding knife are made of a black plastic type material and are in great condition w..
You are looking at a Benchmade Clone of the "Reflex II" Automatic Switchblade Knife. 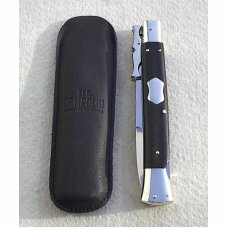 FEATURES INCLUDE: Partially-Serrated 440 Stainless-Steel Drop-P..
NEW OLD STOCK 9" SWING GUARD LOCK BACK AUTOMATIC KNIFE MADE IN 1980S WITH GENUINE BRAZILIAN HORN HANDLES. 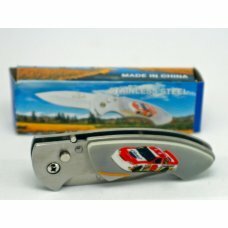 IT HAS A MIRROR POLISHED STAINLESS STEEL AI..
You are looking at a Vintage Mini Italian-Style Picklock Stioletto Keychain Knife, Made in Japan, Circa Late-1970s! FEATURES INCLUDE: Fine-Edge Stainl.. 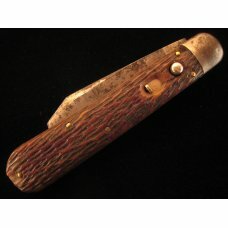 Here is one of my original trapper designs, Dual-Action button fired , 440-C blade 3 1/4 in oal 7 3/8 open the wood i believe is an oak burl , i found..
You are looking at a Rampur Style Leverlock Automatic Switchblade Pocket Knife, made in India. 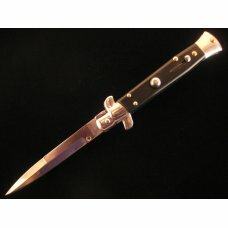 FEATURES INCLUDE: Fine-Edge Stainless-Steel Sabre-Clip ..
New Old Stock 11" Rosewood Swing Guard Switchblade Made in 1980s Maniago Italy. It Has a Polished Stainless Flat Grind Blade Stamped ( 440 B STAINLES..
Smith & Wesson Law Enforcement -Military Switchblade SW1000 Stainless Steel Blade W/ Logo 5 5/8" Closed 9 1/2" Open Black W/ Belt Clip..
BOKER MAGNUM SWITCHBLADE W/ TANTO BLADE 4 3/4" CLOSED 8" OPEN ALL BLACK MADE IN TAIWAN BELT CLIP AND SLIDING LOCK ..
Boker Switchblade Solingen Germany Tree Brand Classic NIB W/ Sheath Black W Black Blade 4 3/4" Closed 8" Open.. If you need info on this or any of my listings, please email me with questions or for additional photos. 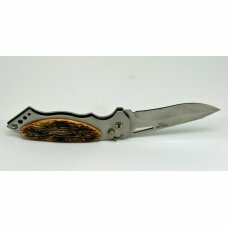 bb35 TOTAL NUMBER OF KNIVES : .. If you need info on this or any of my listings, please email me with questions or for additional photos. db11 TOTAL NUMBER OF KNIVES : .. If you need info on this or any of my listings, please email me with questions or for additional photos. db14 TOTAL NUMBER OF KNIVES : 1 ..
YOU ARE LOOKING AT A NEW MICRO-SIZE AUTOMATIC OTF FOLDING-BLADE POCKET KEYCHAIN KNIFE! FEATURES INCLUDE: Fine-Edge 440 Stainless-Steel Spear-Point Bla..
Nice early 1960s military Schrade Walden MC1 orange paratrooper knife.These were not only military issue, but they were also used by NASA in the space..